R to L (Japanese Style). Searching for the key to save a world beyond hope. Tsutomu Nihei's sci-fi horror epic! Zoichi's Lost Eon Green for now, but other urgent matters have emerged… Data Recovery Foundation forces are amassing around Toa Heavy Inustry headquarters and have taken Dr. Kurokawa and his daughter custordy. A rescue attempt must be made-Dr. Kurokawa's laboratory may yield more information on Eon Green and even Zoichi's own genesis. Elsewhere, Toa Industry agent Nishu Mizunoe searches for Kozlov Grebnev and the secrets he knows about DRF's origins and their apocalyptic plan for the entire human race! By the creator of BLAME! and Noise. Ever since Blame!, I've been following Tsutomu Nihei's works as he becomes progressively more popular in the United States. It is unfortunate that Blame! 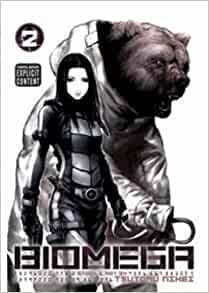 is out of print in the US, being that it's become a cult phenomenon in terms of darker, cyberpunk manga. Biomega is the next level. Nihei's usage of huge, expansive spaces and massive architectual structures creates a heightened sense of grandeur. A style that has certainly become one of his distinctions as a manga artist. He chooses to carry on certain elements from his prior works, such as Toha Heavy Industries, so it makes you wonder if the worlds he creates are tied together thematically. The art work is a bit sharper than the drawings in Blame!, but just as dark and detailed as ever. What I really appreciate about Biomega is that he really conveys a sense of SPEED. The main characters ride these cyberpunk motorcycles that can apparently accelerate to the point of riding on walls. There is a lot of gore. The zombie-like creatures trudging around the cities get popped in the face left and right, so this is not for the faint at heart. Volume 2 elaborates on the elements from Volume 1, but I think the story is told quite clearly from the get go. Usually I have a hard time understanding Nihei's stories until deeper in, so this is a pleasant surprise for me. Can't wait to crush the rest of these books! Finished vol. 1 a while back, have now bought and already ready vol.2 - exciting stuff. I believe I'll just buy the rest of the series (vol. 3-6) and finish this story out. If you like scifi, zombies, and end of the world stories - check this out, think you'll like. This has great action and an interesting story but it starts to jump around in plot and can be a bit overwhelming in how drastically the storyline changes. In classic Nihei fasion, things get turned on their head until he decides to take the story deeper. Then it blows up more. On the bright side I couldn't put it down and read this and the other first two volumes in one sitting. It does pull you in with the art and action making up for minimalist dialogue. Extremely dark dystopian future of mutants and mega-corporations battling for the Immortality genome. There is a girl who has the Immortal mutation and she is everyone's target for acquisition! Two artificial humanoid fight them all to save humanity, what is left of it! Engaging! Very pleased with the order and is exactly as described.